Manchester Friends of the Earth | Tell the European Commission: No Palm Oil in my Tank! Most people do not know that Europe uses more palm oil to make ‘biodiesel’ than to make cookies and cosmetics. The EU subsidises palm oil in diesel fuel as a “green fuel”, even though it’s actually three times worse for the climate than regular diesel. Last June the EU Parliament voted to stop subsidising palm oil in diesel. A recent poll revealed that 69% of people in Europe support the decision. But now it’s up to the European Commission to make it happen with a legal act by February 1st 2019. If the Commission does so, Europe could cut its palm oil consumption in half. Worryingly, the Commission is being lobbied by the Indonesian and Malaysian governments, and by palm oil barons, not to do so. Your voice will help us counter this fierce pressure, help combat climate change, and protect the world’s rainforests and their precious wildlife. Tell the Commission you do NOT want forests destroyed for palm oil in fake ‘green’ fuels. 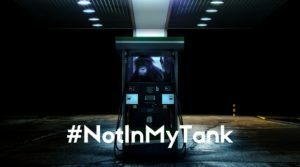 Join over 540,000 Europeans who have already said #NotInMyTank.